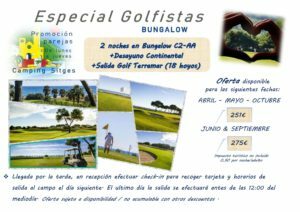 Take advantage of our bungalows , a unique setting such as Sitges and a Golf 18 holes in an exceptional setting by the sea. Arrival in the afternoon, reception making check-in to collect card and departure times to the field the next day. The last day departure will be made before 12.00 noon. Offer subject to availability / not combinable with other discounts. Enjoy a stay in our campsite and an impressive golf 18 holes with a unique beachfront setting in Sitges. Pay 4 nights and enjoy 5. • limited Bungalows B-4 People, C-2, Y C-4 E-4. • Good communication Camping in the center of Sitges, Barcelona Airport. our services even customers with disabilities. The price includes 2 personas, 1 motorhome and 6 power amps. Check in from 20h00 and departure before 10h00. Activities, creative workshops for children. Crafts weekends and high season, every day except Saturday. Film prices for the days of the International Fantastic Film Festival!! Experience the atmosphere on the streets of Sitges where you can find actors and directors of the scariest movies. Pay 2 nights and enjoy 3!!!! *Offer valid for weekend bookings 21 al 24 of June. *Camping good communication with the center of Sitges, Barcelona Airport.